Eagle Superabrasives is a premier supplier of superabrasives in the United States. With an extensive inventory of over 6,000 CBN grinding wheels, diamond and CDX in stock. Ninety-percent of orders are on location and ready for same-day shipping, we can even fill custom orders in as little as seven days. Don’t settle for subpar Superabrasives; contact the industry leading experts at Eagle Superabrasives for all your grinding needs. Diamond is created while its carbon properties are kept under an intense pressure for many years. However, due to its carbon makeup, diamond is not suitable for grinding or machining ferrous materials such as steel. 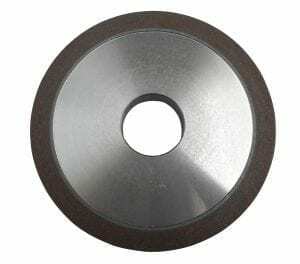 Grinding ferrous materials with diamond, causes the diamond to lose its hardness. The ferrous material breaks away the carbon atoms in the diamond. To combat this problem, CBN was created from the cubic form of boron and nitrogen. CBN has a hardness second to diamond, however it has a high thermal stability and is used for working with ferrous materials. Eagle Superabrasives always recommends using CBN grinding wheels when working with ferrous metals. As CBN grinding wheels are a very hard and durable material, they don’t typically break down from use. The bonds begin to breakdown, removing the superabrasive materials from the resin bond, causing the wheel to lose its hardness and removal rate. Our wheels are built with the correct bonds that our chemist and engineers specially formulate in house. We offer a variety of bonds for our CBN grinding wheels including Phenolic Resin, Polyimide Resin, CDX bond, Vitrified and Hybrid bonding. All of which can be custom made to fit your needs. If you would like to read more about CBN Wheels click here.